The roots of the harmonica can be traced across many centuries. Ancient mouth blown, free reed instruments probably originated in South East Asia. The Sheng from China and the Khene from Laos are two examples, the former of which first arrived in Europe in the early 18th century. Another likely forerunner which is common to many cultures is the Jew’s Harp. A finger plucked, vibrating ‘reed-tongue’ produces the sound. By altering the mouth cavity and vocal tract, the sound quality can be changed. By simultaneously inhaling across the vibrating reed-tongue, the sound can also be amplified. It is the Jew’s harp that is behind that slightly comical twang you hear on the soundtrack to Westerns. It is also closely associated with Hillbilly and Jug Band music. Ancient Roman military tactics may, or may not, have had a bearing on matters too. The terrifying and eerie sound of the Draco was borrowed from other traditions across the vast Roman Empire. It is uncertain however, whether the noise was produced by flute heads, whistles or reeds. There is debate as to whether, and when, these instruments would have influenced the development of the harmonica in Western Europe. Written reference indicates that free reed instruments may have existed in German-speaking Europe as early as the mid 17th century. Pat Missin’s excellent website identifies a German, Cyrill Demian, who claimed the reeds he patented had been used in organs for over 200 years. These were known colloquially as Regale (Shelves), Zungen (Tongues) and Schnarrwerk (‘Buzz’ factories). The term harp is a comfortable nickname for the harmonica. Is this coincidence? Again Pat Missin has done a great deal of research. He found that one particular German company, Carl Essbach, actually sold a “French Harp” brand. The Carl Essbach company (Est.1901) was eventually sold on to A.Seydel and Sons in the 1920’s (and is forerunner of the recently resurrected Seydel-Söhne company). Perhaps the term ‘harp’ is their legacy. Pat also refers to the Aeolian harp, or wind harp. Hung outside in the same fashion as wind chimes, this was a stringed instrument played by the wind. 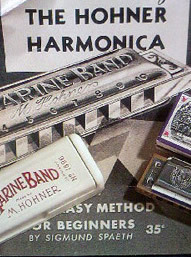 Some early harmonica manufacturers chose the Aeolian prefix for their new instruments. Perhaps this is where the term harp originates. 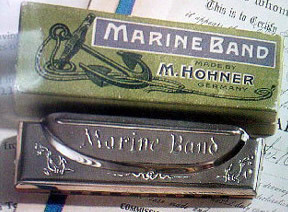 Other names for the harmonica: Harp, Tin Sandwich, Tin Biscuit, Gob Iron, Toot Sweet, Harpoon, Lickin’ Stick, Cookie Cutter, Mississippi Saxophone, Moothie (Scottish), Munspel (Swedish ‘Mouth Play’) and Lady Shaver (some old perv who should get out more). For a more detailed history, visit Pat Missin’s great harmonica site. Good site. I enjoyed the style of the reviews and was delighted to see a bevy of my favorite young harp players presented in The Kids Are Alright.